The market is generally expecting a dovish FOMC statement. We have argued that it will most likely be little changed, except for modification relating to the asset purchases. Keen interest will be on its references to inflation. While the breakeven rates have fallen, the 5-year/5-year forward which the Fed seems to prefer as a measures of inflation expectations is little changed. This may be largely explained by looking at relative liquidity. The preferred inflation measure core PCE deflator may remain firm due to housing costs, even if the headline measures of inflation ease due to the sharp drop in energy prices (recall TIPS are tied to headline CPI). The BOJ is still to meet this week. Here too the market expects a dovish stance, and we are less sanguine. 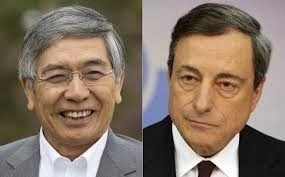 In testimony to parliament yesterday, Kuroda showed no sign of losing confidence. Data over the last couple of days lifts hopes that the hit from the retail sales tax is waning. September retail sales jumped 2.7%. This was three-times more than the Bloomberg consensus. Earlier today, Japan reported September industrial production rose 2.7% compared with the consensus forecast of 2.2%. It completely recoups August's 1.9% decline. There is still more data to be reported this week, including unemployment, overall household spending, and CPI. Yet the reports are unlikely to change the BOJ's enthusiasm to expand QQE. If JPY70 trillion expansion in base money supply does not do the trick, will JPY80, or 90 or even JPY100 work? While reasonable people can differ, it seems that the bar to that decision is higher than many market participants seem to believe. What brought Japan off course, most recently, was not monetary policy but fiscal policy--the retail sales tax hike. Fiscal policy will be the first line of defense. This will likely take the form of a supplemental budget. So, while the BOJ may downgrade its growth forecasts, it is unlikely to hint through its forecasts, or more directly with words, that is poised to increase QQE. Instead, officials seem to suggest that they can simply extend the duration of QQE. Some wags would claim the Fed's third round of asset purchases was QE-Infinity. Maybe QQE is a better candidate. The ECB meets next week. It got more to chew on with today's Q3 Bank Lending Survey. The key take away is that the conditions of both supply and demand for credit by households and business continued the improvement seen in Q2. However, the improvement was less than expected, and other details were disappointing. For example,the slightly greater demand for credit from businesses was not for new investment but for M&A activity. More importantly, the geographic breakdown suggests two things. First, that the core is doing better than the periphery. Second, that France is part of the core. Banks for more willing to lend in Germany and France. There was no change in Spain and Italy. Businesses in Italy showed less demand for credit, while demand increased in Germany and France. There has been several reports in the press recently describing a strained relationship between Draghi and Weidmann. Representing all EMU members, Draghi has to navigate the ECB between the interests of the creditors and debtors. Weidmann thinks only of the creditors. However, one thing that they both could share a beer over is their shared disappointment with the EC failing to take advantage of an opportunity to increase the incentives for France and Italy to (finally) institute real and significant structural reforms. Instead, the EC allowed France to adjust its initial budget proposal by 3.6 bln euros. This savings is said to be achieved by 1) lowering the projected debt servicing costs, 2) a lower EU budget contribution, which reflects the dismal growth of its national income, and 3) raising 900 mln euros by cracking down on tax evasion. What does this mean? In the accounting of the EU, France's structural deficit is reduced by 0.5% rather than 0.2% of the original proposal. It had previously agreed to a 0.8% cut. Italy was to deliver a 0.7% cut in its structural deficit next year. Its initial budget proposal projected only 0.1% improvement. What it has done is to take 3.3 bln from funds set aside for tax cuts to reduce its deficit. This largely accounts for Italy's improved proposals allowing for a 0.3% reduction in the structural deficit. At the end of the week, the ECB will see the preliminary October CPI. The headline is expected to tick up from 0.3% to 0.4%, while the core rate is projected to be unchanged at 0.8%. The ECB may also be relieved by the results of the Reuters poll that found the consensus expects 175 bln euros to be borrowed in the December offering of the TLTRO (Sept was almost 83 bln). The 1.7 bln euros of covered bonds bought last week was in line with leaks, but was also twice as much as the pre-leak projections. The ECB, like the BOJ, are on a path, and newest inputs are unlikely to sway them.